The Kings of the Sevens 2016 festival makes its first stop of the weekend in Kelso on Saturday – and the hosts hopes to serve up a great day out as well as some thrilling rugby. A fine hospitality package has been lined up and everyone at Poynder Place hopes those who invest in it can enjoy some great food and entertainment. “At Kelso, we do try to go big on hospitality,” said club president Terry Frame. by Peter Allan, of the local racecourse, while there is a disco and dance after the tournament. There is also a hospitality Q&A session with Andrew Ker, one of the most decorated players in the Borders game. On the field, the 16-team line-up features, as ever, all the big familiar names from the south, along with travelling line-ups from around Edinburgh, Fife and Tayside. 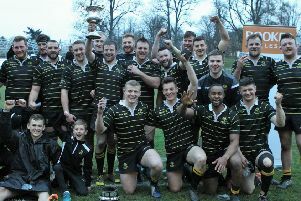 Kelso’s sevens lynchpin, Andrew Skeen, is injured, which, said Mr Frame, summed up the side’s “unlucky season”, but everyone was looking forward to the day. Kelso will also be showcasing its new ladies’ team, which will be playing at 1pm, an hour before the main action starts.